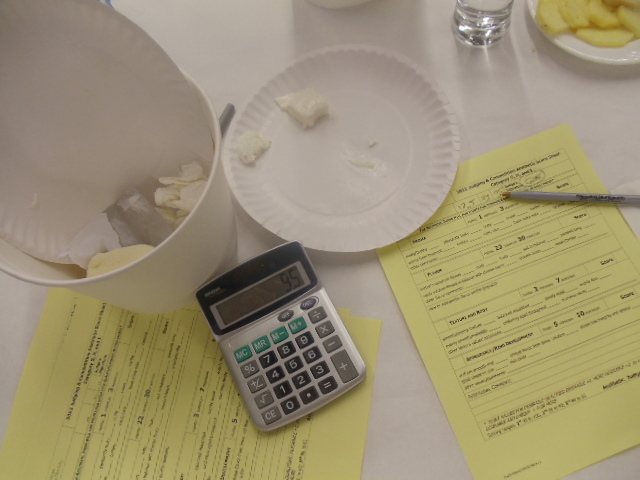 Whenever I get a chance to be a cheese judge at the American Cheese Society Conference, I grab it. I really do love it. I am honored to be asked – and that is part of it – but I love it mostly because it is pure cheese: just me, my mouth, and 1771 anonymous cheeses. Of course I don’t have to taste all 1771 (or whatever a given year’s number is). Judges only have to taste around two hundred: one hundred assigned via category, then another hundred that won their class and are competing for Best of Show. Still, it’s a lot of cheese over the course of two days. I am not complaining, however. Not at all. I have written about judging before, but every competition has its own merits. 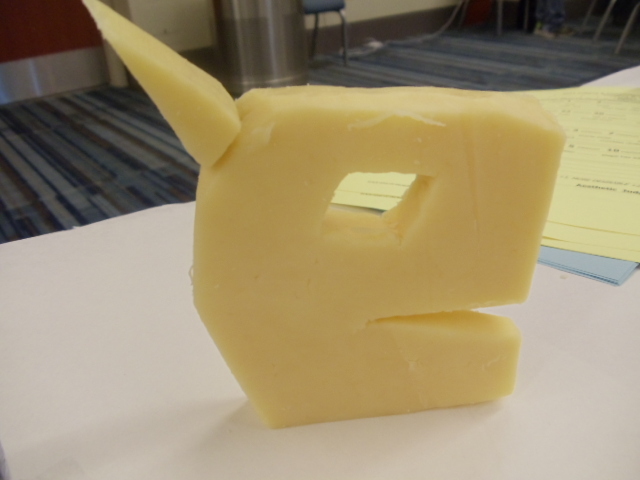 Many cheese judgings use the 4H method, which is non-numerical. There are variations but usually judges taste and then (in their heads) rate the cheese before announcing “Gold,” “Silver,” “Bronze,” or “No award.” If judges are unanimous on “Gold”, the cheese is awarded “Double Gold” and those go into consideration for Best of Show. Other competitions are scored technically. Dairy scientists are looking for perfect versions of a cheese by type. You have never seen Wisconsin dairy science folks excited until you see them hotly debating the merits of the Colby category! * Technically perfect cheese usually wins these competitions whether or not they are complex or powerful. At ACS the technical judges are teamed up with aesthetic judges (cheese professionals who are not dairy scientists) in a good cop/bad cop situation. Technical judges start from 50 and grade down for mistakes. Aesthetic judges start from zero and award points for positive attributes. In this way a cheese may even get deductions and positive points for the same flavor attribute. An extremely sweet Cheddar, for example, may lose a little for not being classic, but may gain a lot if that aesthetic judge sees value in its unusual flavor attributes. This means that both technical cheesemaking and innovation can be rewarded in the same contest. It is also why cheese with big flavors usually wins Best of Show. I have seen critiques of the ACS judging for this reason. 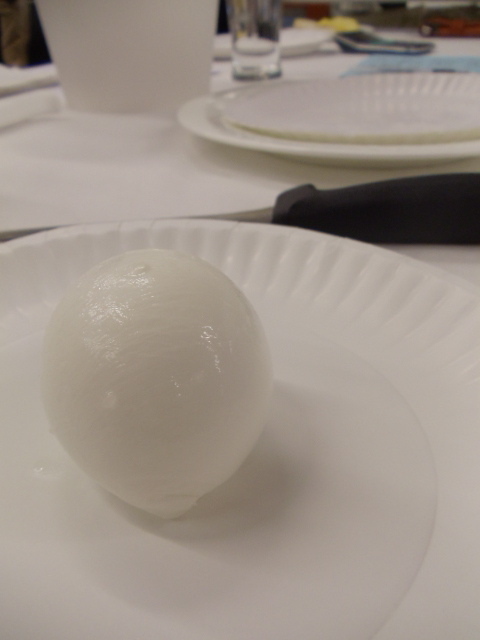 I don’t believe that a technically perfect fresh mozzarella, for example, has ever come close to winning Best of Show. It can win its category, but BoS winners are usually in the Alpine family, blue category, washed-rinds, or aged: in other words, the big flavored cheeses. Which makes perfect sense since the ACS was set up to support cheesemakers making innovative cheese. Almost every cheese that has won in the last decade has been a cheese that, upon tasting, a customer at some point has asked me, incredulously, “That cheese was made in the US?” This comment – once an every day occurrence – is dying out these days as people realize the breadth of cheese styles now being made extremely well in this country. And I think the ACS competition has played a part in that growing awareness. Lastly, what everyone – retailers, cheesemakers, cheese eaters reading this etc. — needs to keep in mind is that we can only judge the cheese in the room. I had a cheese that I usually love that was not at its best last week. As a cheese seller of many years, there is no way not to recognize the distinctive characteristics of some cheese, even if I actively avoid acknowledging I recognize it to my fellow judge or letting it sway me, good or bad. On a normal day, I know that cheese to be better than what I tasted in that judging room, just like I know that some winners never tastes as good when I try to order it for the store. Come to think of it, that would be an awesome contest too: a consistency competition where the same cheeses are tasted in, say, 6 different batches over the course of the year. But in this judging, we can only judge what is in front of us. Anyways, I will post tomorrow about some of the great cheeses and winners at this year’s competition, but today I just wanted to set the stage. Judging. It’s awesome. ***Obviously this is a name chosen because it was not one of the actual name used. In this way I am remembering Leticia’s restaurant on Market St. whose closing has left a little hole in our hearts. ****I am still kicking myself for not reacting strongly enough at one non-ACS judging. After loudly discussing every cheese’s origin as they judged it, one individual came to one that they didn’t recognize and asked me if I knew what it was. I responded, “Why do you need to know who made it to judge it?” They responded to me, “Why do you think that would affect my scores?” I didn’t realize that “blind judging” was an ambiguous term.